How the idea of a Permanent Iconic exhibition was born? Unlike the other art schools that developed during the Bulgarian Revival Period, the school of the town of Bansko continued to develop also after the Liberation. During that time, magnificent models of iconography and woodcarving came out of the craftsmen’s hands, leaving a bright mark in the national memory. That is why, within a period of 10 years, a team of specialists have explored churches and monasteries, gathering information and original icons work of the masters from the school, making photocopies of the frescoes, which are known to be work of the Zograf school of Bansko. In 1985, „Bansko – art center” was organized, a large national scientific forum showing the collected works. 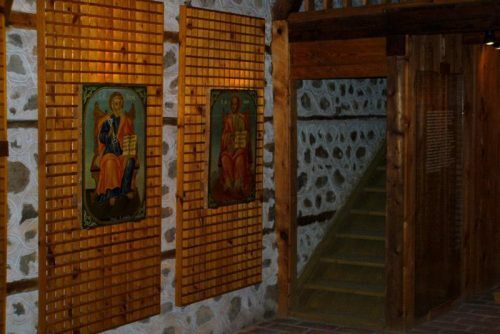 The temporary exhibition was arranged in the Community center of the town of Bansko, and there were presented original icons, photocopies of frescoes, woodcarvings and architectural works of the School of Bansko. The exhibition was so successful that later on it was presented also in Sofia city, where the success was even bigger. Thus at the end of 1986, it was decided a Permanent Iconic exhibition to be opened – in the town of Bansko. 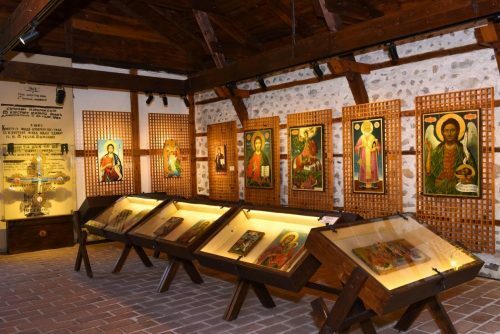 The icons were restored, and the exhibition found its new (and permanent) home in the renovated building of the nunnery in the town of Bansko. The art and woodcarving school of Bansko was established at the end of XVIII century and its founder is Toma Vishanov – Molera. He was a clever young man who had the opportunity to study arts in Germany and Austria, where he found one different world, as he developed a new way of thinking and learned techniques that were not known in Bulgaria. Molera gained experience and got familiar with the modern European painting techniques, then he returned to his birth place in the town of Bansko and started creating. The painting of the cemetery church in Bansko is his work, as well as the church „Pokrov Bogorodichen” in the Rila Monastery. According to some of the researches who explore the art of Molera, the carved iconostasis in the cemetery church in the town of Bansko is also his work, because at that times in the town there were no other carvers, and the style of the work strongly resembles the modern European style of Toma Vishanov. Molera used techniques that were not familiar in our country and they were not widely accepted by the society, that’s why his son Dimitar distanced from the style that was though to him by his father, and returned to the older, more conservative Mount Athos iconography. Dimitar Vishanov gained more recognition than his father and became one of the most appreciated masters not only in the town of Bansko, but also in the Balkans, as well as abroad. His popularity is evident by the many orders that he made over the years. The frescoes on the chapel of the Rila Monastery – “Archangel’s gathering” and in the church „Pchelino” are his work, as well as the icons in the churches in Bansko, Leshko, Rila Monastery and others. Dimitar was also highly appreciated in Greece, Serbia and Macedonia, where nowadays you can see icons made by the famous master. Most probably icons and frescoes made by Dimitar Molerov can be seen in many other places, in churches and monasteries all over the country and abroad, but unfortunately the master has not signed his works, so the authorship is difficult to be proved. Gradually around father and son Molerovi was formed a Zograf-carving School, to which have joined artists such as Usta Velyan and his son Angel Velyanov, Dimitar Sirleshtov, Hriso Galabov and others. The school grew and became very famous, as the masters were wanted throughout the entire Balkan Peninsula. We are sure that if you are on a holiday in Bansko, one of the places you have chosen to visit is the Permanent Iconic exhibition- town of Bansko. We are also sure that you can easily find information about where it is located and what you can see there. We will also give you information about that, but first let’s talk about the Zograf School in Bansko, as it is one of the main reasons due to which today you have the chance to see the unique icons and frescoes that are located in the museum exposition. We return to it because the museum exposition is dedicated, as we have already mentioned, to the icon-painters from the Bansko School, and in particular to the works of its founder Toma Vishanov and his son Dimitar. The exposition is located in several halls where the history of the Bansko Zograf School can be reviewed chronographically. As you explore one hall after another, you will see the development of the school over the years. You will be able to feel the eclectic modern and innovative style of Toma Vishanov, the unusual and tender drawing manner in his works, you will sense the change in style in the works of his son and grandson, you will be able to enjoy the icon-painting talent of the other members of the school. A central place in the Permanent Iconic exhibition – town of Bankso, is set for the original icons of Toma and Dimitar Vishanovi, and for many documents and photocopies of frescoes in the churches in which they have worked. Also very interesting thing to see are the donor’s portraits of Hadzhi Valcho and Lavrentii, who were one of the greatest connoisseurs and donors of the Bansko Art School, the authentic sketch-book of Molera, as well as brushes and other belongings of some of the apprentices of Molerovi. Apart from the Permanent Iconic exhibition, is there any other place to see works from the Bansko School? Often, people who have visited the exhibition come out of it extremely impressed, so they are looking for more works to see, made by the talented icon-painters from Bansko. So, if you are interested, after you see the exhibition, you can see the biggest landmark of Bansko – the “Saint Trinity” church. In it you can see icons made by Dimitar Vishanov, and the frescoes are the work of Usta Velyan. The Bansko Zograf School is one of the main reasons for the creation of the famous architectural style Fortified house of the Bulgarian Revival period. The houses that were built in Bansko from the middle of XVIII until the middle of XIX century are distinguishable not only by their specific construction (as an inaccessible fortress), but also by the fact that people from Bansko painted the verandas, the rooms, even the hiding places in their homes. One of the most interesting and beautiful houses from the Revival period is the Velyanova house and it is not only a symbol of the characteristic architectural style, but is also painted by Usta Velyan – one of the most prominent representatives of the Bansko Zograf School. In the Velyanova house you can see not only exceptional frescoes made by the master that nowadays shine in strong and bright colors telling stories, but also you can enjoy the incredible wood-carved ceilings that are also the work of the master. Bansko has preserved for the generations an entire neighborhood, where are located houses from the Revival period built in the style of the Bansko fortified house, as in each one of them you can find frescoes or wood-carving made by a master from the Bansko Art School. 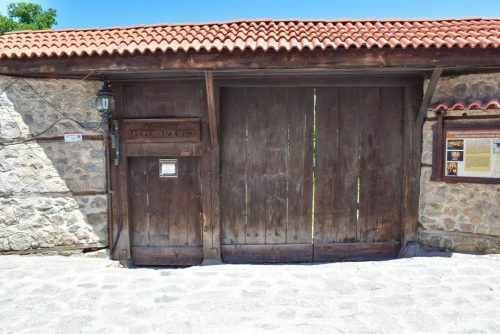 Don’t miss to see also the house of the founder of the school, Toma Vishanov, if you want your exploration journey of the talent of the masters from Bansko to be full. At the beginning we promised you information about the Permanent Iconic exhibition – town of Bansko. Although we are sure that you can find easily the museum on your own, let’s just add that the iconic exposition is located at N3 „Yane Sandansky” street. You can see the exhibition from Tuesday to Saturday from 9.00 a.m. to 17.00 p.m., as the break is from 12.00 to 14.00 p.m., and Sunday and Monday are not working days. If you visit the Permanent Iconic exhibition on the second Wednesday of the month, you can enjoy it entirely for free. In all other days, the entrance ticket is 3 BGN for adults and 2 BGN for university and school students. If you want you can attend lectures that are organized by the museum in several languages –Bulgarian, English, Russian, French and German, as the lecture in Bulgarian language costs 5 BGN, and the lectures in other languages cost 10 BGN. The site provides the required access equipment for disabled people. The Permanent Iconic exhibition is part of the hundred national sites and there is a seal there, which you can get from the house-museum „Nikola Vaptsarov”.